Compare discounts for Hotels Resorts in St. Simons Island, Georgia! Permanently settled in 1636 St. Simons Island is an ideal resort getaway. Fort Frederica National Monument, Hamilton Plantation and the St. Simons Lighthouse are a popular tourist stops located on the island. Other popular activities include golf, tennis, swimming, bicycling, jogging or just relaxing on the beach. Accessible only by boat, Little St. Simons Island is the northernmost point of the Golden Isles, adjacent to Saint Simons is the most secluded of them all Georgia's Golden Isles. For many years a privately owned retreat, the Island now offers a limited number of guests the rare opportunity to experience the enchantment and solitude of the isolated beaches. Note: Lists are not identical. 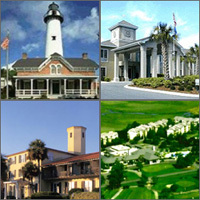 Different sites offer different accommodation options for St. Simons. The King and Prince warm welcome begins in a soaring, sun-washed atrium where indoor heated pool and hot tub await. From there discover the comfort of the Resort's guest accommodations. Oceanfront, poolside, and court view rooms are available, complemented by luxurious two and three bedroom Beach Villas. Experience the island difference at the Best Western Island Inn. ResortQuest at The Beach Club is St. Simons Island's largest oceanfront condominium complex with 152 condo units and direct beach access. Stately Oak trees and tropical foliage provide a dramatic entry into the community. Located 15 minutes from the I-95, the Quality Inn Island House has a convenient mid-island location, adjacent to shopping, restaurants, and antique shops and within 2 miles to beaches, golf, off shore in-shore fishing, Neptune Park Fishing Pier, Marina, water sports, the intercoastal waterway, private airport. At the Quality Inn Island House guests will find find exceptional value with comfortable accommodations, a convenient location and affordable rates. This condominium community is situated on landscaped grounds with oak trees, fountains, and a duck pond. The 100% smoke-free Holiday Inn Express offers 60 tropically decorated, casual and comfortable, interior corridor guest rooms on historic St. Simons Island. This resort is located in a gated beachfront community, 2 miles from Shops at Sea Island and 7 miles from Jekyll Island Museum. Located in a gated community, ResortQuest Rentals at St. Simons Grand is less than four miles from Jekyll Island Golf Course. Located in a beachfront community, this resort is less than four miles from Jekyll Island Golf Course. Nestled under the giant live oaks between the parks and the commercial area of the historic oceanfront Village and Lighthouse District you will find the new and unique Village Inn and Pub. Across the street from the Saint Simons Lighthouse and Museum, the Saint Simons Inn by the Light House is one mile from the beach. Located On Sea Island And 5 1/2 Miles Of Private Atlantic Beach The Cloister At Sea Island Offers Elegant Resort Facilities Superior Amenities outstanding Family Activities And Three Championship Golf Courses Truly A Golfers Paradise. Located On Sea Island And 5 1/2 Miles Of Private Atlantic Beach The Lodge At Sea Island Offers Elegant Resort Facilities Superior Amenities outstanding Family Activities And Three Championship Golf Courses Truly A Golfers Paradise. The Sea Palms Golf and Tennis Resort is located on 800 acres of the historic St. Simons Island. The resort is located near the airport, restaurants, beaches, and shopping.